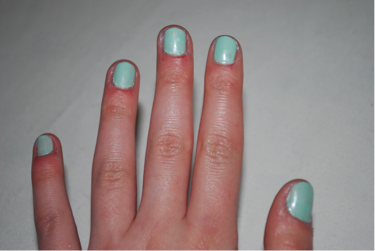 Mint green is one of my favourite nail colours for spring and summer, not too bright, and surprisingly flattering. 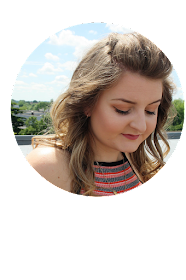 Considering this, it’s not a surprise that being the nail polish addict that I am, I have amassed quite a collection of mint polishes, here I’m going to run you through 5 of my favourite and most used ones, so lets get going! The cheapest contender here, and the longest lasting too! 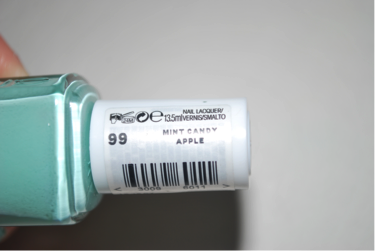 This is a very clean and classic mint shade and the closest dupe that I have found for my long standing favourite, Essie ‘Mint Candy Apple’, having said that I actually prefer the formula of Maybelline’s offering because it is so long lasting. The brush is nice and wide which makes it easy to get an even finish, I used 2 coats for a smooth and opaque finish. 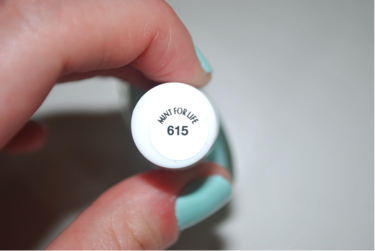 This polish definitely has the strongest green undertone of the 5 that I’m looking at. In the bottle this polish has a bit of a pearlescence to it which almost made me not purchase it because I think that pearly nail polishes can look really dated but it doesn’t look pearly on the nails at all. 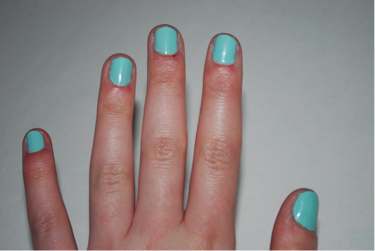 The formula isn’t fantastic, it is a very sheer polish and 3 coats for opacity. Nice colour though, and a little bit different which is always nice. 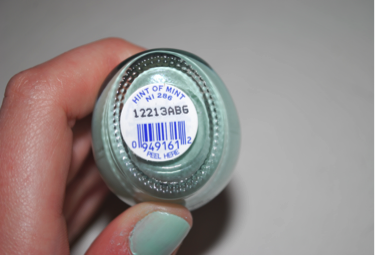 Despite the formula not quite being there (in my opinion) this is probably my favourite mint polish. It’s a little lighter and more blue toned than the other ones that I own, which I find to be more versatile and more flattering on my skin tone. Like I said, the formula is not the best, it does require 3 thin coats for opacity and the first 2 coats do tend to be a little streaky, but if you have the time and patience, you can get a really beautiful effect in a really lovely, flattering colour. This is probably the darkest polish of the 5 that I’m talking about, because to be honest if it was any darker, it probably just would be teal. 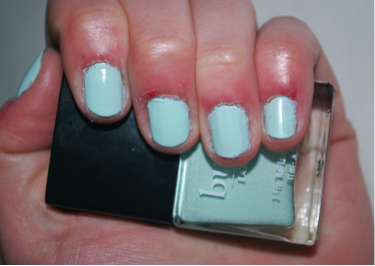 Where the other polishes are mainly minty blues and very pastel-y with lots of white in them, this one is more of a mix between a mint green and turquoise. 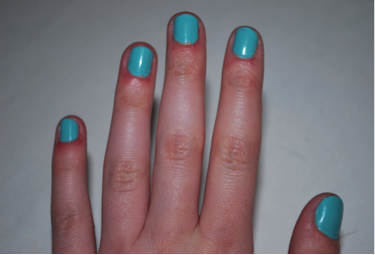 This is really flattering with a tan as well, so pretty. 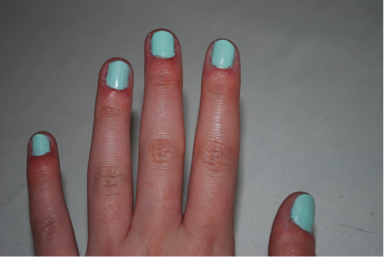 2 coats for full opacity, the formula is a little on the thicker side but its not hard to work with. 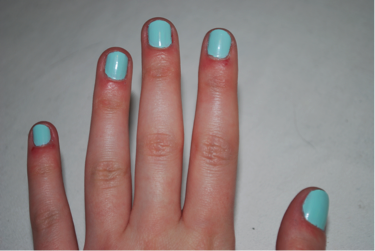 Last, but most certainly not least, is Essie’s ‘Mint Candy Apple’. 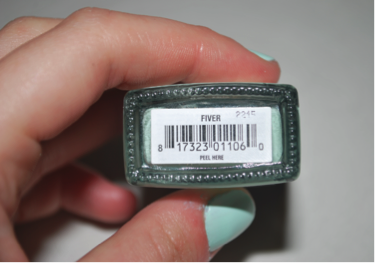 It’s the classic mint green polish and really the first one that I owned, so I definitely blame this one for my obsession! This is definitely one of the first polishes that I reach for when spring rolls around, and I wear it all the way through summer too because it looks amazing with a tan. I used to have the version with the normal brush and application was pretty tricky with that, but I loved the colour so much that I purchased the diffusion line version and the thicker brush simplifies application so much, 2 coats and you’re good to go. So there we have it, do you have any mint favourites that you think I should take a look at?